This mild, slightly nutty taste gives a distinctive flavour to vegetable dishes, salads and many other dishes. 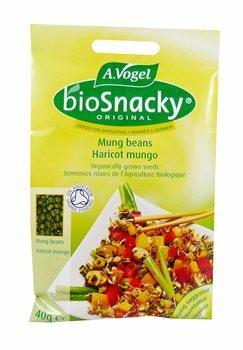 Mung beans are an excellent source of vital nutrients. With BioSnacky seeds it is easy to grow crisp, fresh sprouts on a daily basis. Mung Bean sprouts complement light meals at any time of the year. The mild, slightly nutty taste gives a distinctive flavour to vegetable dishes, salads, and many other dishes. Mung Bean sprouts are an excellent source of vital nutrients and contribute to healthy, balanced nutrition. Before sowing, rinse thoroughly in fresh water. For best results sow seeds thinly. Germination time may vary with temperature.